Featuring over twenty thousand lights the Niagara Parks Christmas tree is presented by the International Brotherhood of Electrical Workers (IBEW), Local 303. This thirty-foot tall illuminated Blue Spruce was unveiled on Friday, November 16th and is located at the Surge Tank besides the illumination tower adjacent to Queen Victoria Place and was decorated by the Niagara Parks Commission. 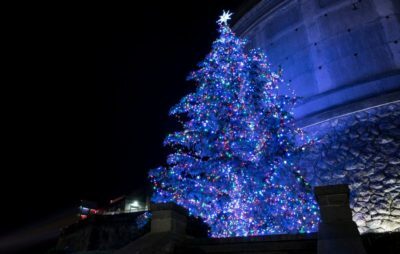 This exquisite Christmas tree casts a vibrant blue glow over the Niagara Parkway.